Windows Phone’s next big update is truly going to be huge - it will bring the operating system to version 8 and along with that will introduce change to the very core of the mobile platform. More evidence has surfaced cementing the notion that Windows Phone 8 will run on the NT kernel, the same kernel Microsoft uses in Windows 8. This will mean that Windows CE is finally become history after more than 15 years of service. In layman's terms, a kernel is the main element of an operating system bridging communication between apps and the actual hardware on a device. Windows Phone is built to be kernel-neutral, so the change won't affect existing application. WPDang dug deep in the registries of the recently released Windows 8 Consumer Preview and found a snipped showing “PhoneNT.” This is a clear reference to Windows Phone 8 using the NT kernel. What’s more, this was reportedly not included in the preview of WIndows 8 released earlier. The use of NT kernel will mark a departure from the existing Windows CE kernel on current versions of Windows Phone. The NT kernel opens a world of possibilities with wider support for USB Host, expandable external storage (Windows Phone currently does not support microSD cards) and more chips and resolutions. This should also benefit both users and developers as Microsoft will basically need to update one system, rather than many and programmers would be able to reuse much of the code they write for Windows 8 in Windows Phone 8. “Switching to the NT kernel should have no impact on existing WP7 applications as those apps have no direct access to Windows CE. This really should be a very seamless move for both applications and end-users. The ODMs (original design manufacturers) and carriers are really the only ones who have significant work to do since drivers or any other native mode software they wrote will need to be ported or rewritten. But things written with Silverlight/.NET/XNA should just work. I guess there might be a caveat for apps that use some esoteric feature that Microsoft decides to deprecate, but since most such features would only have been exposed in Mango I doubt Microsoft would have exposed them at all if they didn’t plan on carrying them over to WP8,” Berenson summarized for CNET. same, like that design too.. but, oh, my.. seems like many form of devices are getting connected to each other even more seamlessly.. kudos to that! Now maybe WP8 and a win8 tablet and PC will be one of the best ecosystem! and thus, the lines between phone and true computer are officially being blurred. hallelujah! It is a shame that MS is only just now bringing their 'A' game to the phone/mobile party. 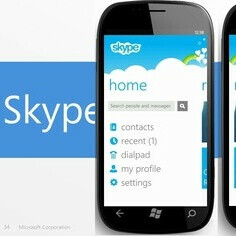 It will be interesting to see how the WP8 handsets compete against Android and iOS.